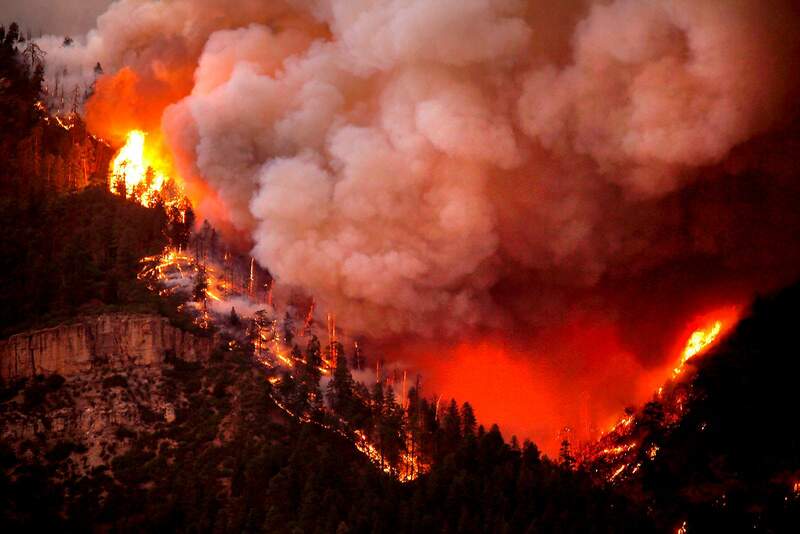 The 416 Fire burns down Hermosa Cliffs on June 6 above U.S. Highway 550 on the southeast side of the fire. According to Colorado College’s annual Conservation in the West poll, nearly 70 percent of respondents said that wildfires were more of a problem today than 10 years ago. According to a recent poll, voters across the West are substantially more worried about climate change now than they were just two years ago. What’s more, a majority identify as “conservationists.” These attitudes are at odds with the priorities of President Donald Trump’s administration, which have included aggressively cutting environmental regulations while shrinking national monuments and encouraging fossil fuel production on public lands. These findings come from Colorado College’s annual Conservation in the West poll, which surveys residents in Arizona, Colorado, Idaho, Montana, Nevada, New Mexico, Utah and Wyoming on issues of climate, energy and public lands. This year, a majority of the approximately 400 respondents in each state rated climate change a serious problem, and every state saw an increase in climate concern. These fears may be driven by climate change’s growing impacts in the West, such as drought and fire. Nearly 70 percent of poll respondents said that wildfires were more of a problem today than 10 years ago. Climate change is playing an increasing role in the West’s lengthening fire season and intensifying blazes, according to the Union of Concerned Scientists. Indeed, the survey found that climate impacts have started to surpass more traditional political preoccupations, like the economy: Respondents rated low river and stream levels, water quality and insufficient water supplies of greater concern than wages and unemployment. The poll has habitually found bipartisan support for the outdoor recreation industry and land access, said Corina McKendry, director of the State of the Rockies Project and an associate professor of political science at Colorado College. But “the rejection of the current administration’s priorities is particularly intense here,” she said in a press release. Whether that influences upcoming elections – such as 2020 re-election bids by Trump and by the politically vulnerable Colorado. Sen. Cory Gardner, R, who will face questions about his ties to the administration and support of fossil fuel industries – is unclear. Public opinion polls often find widespread concern regarding climate change and support for policies to address the crisis. But these issues rarely swing elections, where foes of climate policies often highlight the economic and social costs of increased environmental regulations. In Colorado, where poll respondents overwhelmingly claimed to prefer environmental protection over energy production, voters roundly rejected a ballot measure in 2018 to limit hydraulic fracturing, following an industry-backed publicity campaign against the measure. “There is strong evidence that Americans support environmental protection and conservation efforts and that they have substantial concerns about environmental issues such as climate change,” said Christopher Borick, director of the Muhlenberg College Institute of Public Opinion, who has worked on other environmental polling projects. “However, their concerns are often less intense than those regarding other issues.” Midterm exit polls showed healthcare, immigration, the economy and gun control as the top national issues for voters in 2018. According to Borick, achieving robust climate policy requires that the environment compete with, and even surmount, these other political concerns. How soon this happens is an open question, even as Westerners increasingly worry about rising temperatures, drying streams and hotter fires. Nick Bowlin is an editorial intern at High Country News.